DISCOUNT for a week long stay! This is the actual view from the deck and living room of this spacious (1150 square feet) 3 bedroom, 2 bath condominium. Watch the alpen glow illuminate Baldy Mountain from the private deck or while you relax before the gas fireplace, watching cable TV or a video from the on-site collection. Prepare an elaborate meal in the remodeled kitchen and set an impressive table for your entire party. Catch the FREE Summit Stage for the short ride to the ski lifts, gondola and downtown shopping. Avoid slippery roads and paying for parking. Past guests have raved about the comfort, convenience, setting, and excellent value of this spacious and welcoming home. RENTAL AGREEMENT: The Owner and Guest listed above agree to the following terms and conditions. The Guest is an adult and will be an occupant of the unit during the entire Vacation Rental Period. Other occupants will be family members, friends or responsible adults. Use of the premises will be denied to persons not falling within the foregoing categories, and as a result they would have to vacate the property immediately without any refund. No keys will be issued to anyone who is not an adult. DAMAGE DEPOSIT: The damage deposit may be used to reimburse the property Owner for costs incurred to repair/replace damaged items. I understand that by signing below, I am also accepting liability for any damages caused to the property by myself or my family and/or guests, including but not limited to landscaping, entire interior, misuse of appliances, and/or supplies and furnishings. In the event that damages exceed the above Damage Deposit amount, the Guest agrees to pay the owner for the additional damages. Guest charge for a LOST KEY is $50. PETS: The Condo is a PET-FREE ZONE. Pets are not allowed under any circumstances. SMOKING: The Condo is a SMOKE FREE ZONE. Smoking is not allowed anywhere inside the condo. Although legal in Colorado, the smoking of marijuana is NOT allowed anywhere inside or on the deck. Smoking is not allowed on the deck nor on the walkways. The only place smoking is allowed is in the parking lot. CHECK-IN: Check-in time is 4:00 p.m.; early check-in is allowed when the property is cleaned and ready for occupancy and prior approval has been given. CHECK-OUT: Check-out time is 10:00 a.m.; prior approval is needed for late check-out. We’ll be flexible whenever possible. Check-out procedure will be communicated in detail by email. Guests are expected to strip the beds of sheets and place them together with used towels in a central location, deposit their trash in the dumpster and run the dishwasher (need not unload it). Please leave all keys, remote controls, and other property of the owner in the unit. A replacement fee will be charged for any items removed from the premises. CLEANING: The property will be inspected after your departure to be sure there was no damage and the condo was left in good order. If damage, your deposit will be applied, repairs made, and balance returned to you. TELEPHONES: You must use telephone credit cards or call collect when making long distance phone calls. There is no charge for local or toll-free calls. The condo phone number is. WHAT WE SUPPLY: The property is equipped and set up as a fully furnished property that will include bedspreads, linens, blankets & pillows (for the beds only, no 'couch surfing,' towels, as well as a fully equipped kitchen, 2 TVs, furniture. There is no laundry equipment within the condo. It is located on the bottom floor (same building) directly below the condo. You are required to bring your own quarters. WHAT YOU SHOULD BRING: Although the bathrooms will have paper supplies & hairdryers, you may want to bring personal items such as shampoo and personal toiletries. Quarters for the coin-op laundry equipment, located downstairs (not in the unit) in the same building. 1. Occupancy exceeding the sleeping capacity stated on the reservation confirmation. 2. Using the premises for any illegal activity including, but not limited to, the possession, serving or consumption of alcoholic beverages by or to persons less than 21 years of age. 3. Causing damage to the premises rented or to any of the neighboring properties. 4. Any other acts which interfere with neighbors’ right to quiet enjoyment of their property. Please review the posted House Rules upon arrival. HOLD HARMLESS: The Owner does not assume any liability for loss, damage or injury to persons or their personal property. Neither do we accept liability for any inconvenience arising from any temporary defect or stoppage in supply of water, gas, electricity or plumbing. The Owner will also not accept liability for any loss or damage caused by weather conditions, lack of snow, natural disasters, acts of God, or other reasons beyond the owner’s control. DECK: The Guest hereby acknowledges that he/she is fully aware that the deck can be dangerous, that the deck can be slippery when wet, and that injury is likely to occur to anyone who is not careful. With full knowledge of the above facts and warnings, the undersigned accepts and assumes all risks involved in or related to the use of the deck area. ADDITIONAL TERMS AND CONDITIONS: The undersigned, for himself/herself, his/her heirs, assignors, executors, and administrators, fully releases and discharges toe Owner from any and all claims, demands and causes of action by reason of any injury of whatever nature which has or have occurred, or may occur to the undersigned, or any of his/her guests as a result of, or in connection with the occupancy of the premises and agrees to hold the Owner free and harmless of any claim or suit arising therefrom. In any action concerning the rights, duties or liabilities of the parties to this agreement, their principals, agents, successors or assignees the prevailing party shall be entitled to recover reasonable attorney fees and costs. This agreement is posted on my rental webpage so your reservation assumes compliance with all terms and conditions above without your actual original signature. Thank you in advance for your respectful treatment of my property and that of my neighbors. Enjoy your time in Breckenridge! I knew I wanted to own a condo in this building the minute I saw the views. It overlooks Baldy Mt to the L and faces the ski area. The private deck sealed the deal. My son-in-law is the property manager and lives right across the road from the building. He's always willing to attend to the smallest detail to ensure a pleasant stay for guests. You'll fall in love with our home-away-from-home as other guests have, returning year after year for family holidays and reunions with good friends. It's a place to make memories to last a lifetime. toilet, shower, Oversized shower with beautiful tile surround. Bathrooms are newly remodeled, with Kohler fixtures and tile throughout. Just short Summit Stage ride from Main Street, about 1.5 miles. Snowshoe right from the property. Cross country ski on Boreas Pass just .5 miles from front door. Hiking and mountain biking in the summer directly from the condo. Stunning views of Baldy, Quandry, Breckenridge ski area. Just steps away on lower level of building. Gas range new in 2018. Private deck overlooks valley and ski area beyond. Deck furniture provided all year long. Washer: Just steps away on lower level of building. Dryer: Just steps away on lower level of building. Catering Available Mountain view Gas fireplace (turn on with a switch), DVD & VCR with a collection of movies, coffee maker with timer & grinder, laundry facilities in the building, please no pets, no smoking in the home or on the deck. Golf Course nearby, hiking, snowshoeing. Great place. All the amenities. Awesome view. Had a wonderful stay. The property was well kept and had all the amenities available. It had a spectacular view. The fireplace was so cozy. We truly enjoyed ourselves. I'm so glad you enjoyed my 'home in the sky,' Amie! You are welcome to return any time. Breckenridge is lovely in the summer and fall, also. Thank you! Perfect vacation property with amazing view of the mountains. This property suited us perfectly for our ski trip to Breckenridge. A clean 3 bedroom property with the most amazing view of the surrounding mountains. The kitchen was well equipped and the living space was homely with a panoramic window to the beautiful world outside! It is located in a very quiet area but only a 5 minute drive to the center of town. I would highly recommend this property. I loved the view at this condo! We were really impressed that it was so clean. The fireplace was wonderful! Thank you, Alexandra. I'm glad you were so pleased with my home for your recent stay in Breckenridge. Breckenridge is a wonderful destination in the summer, too! Please come back soon. Happy holidays! Sally. We brought our son and in-laws with us for a wedding that was at the lodge next door, which literally shares a parking lot and is walking distance from this condo. Downtown Breck is less than 5 min away and Susan will tell you where the best places are to eat, get groceries, grab a drink, order pizza, etc. She made our stay so easy by helping recommend where to find things in the area. Susan was overly responsive from the minute we booked our trip and throughout our stay. The condo itself has a gorgeous view of the mountains with tons of windows and a huge deck. It’s clean with a nice open floor plan, plenty of sleeping space and nice bathrooms. The only thing that would have been nice is a grill, but I assume that was restricted because of the wildfires. You can’t go wrong with this place, it’s fantastic! Comfortable condo. Plenty of room for everyone. Updated Kitchen and bathrooms. The views from condo are absolutely gorgeous. Everyone was wonderful and so pleasant. Will definitely stay here again! 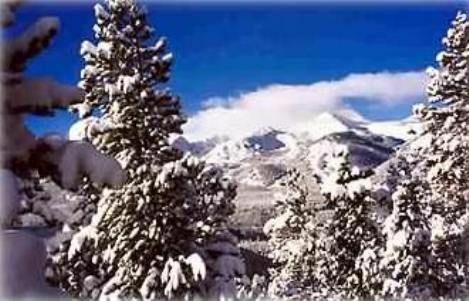 Breckenridge Properties, Breckenridge, Northwest, Colorado, USA (1 mi to Main St; FREE Shuttle from parking lot to gondola & lifts). Your 7th night is FREE with a one-week reservation. A rental agreement will define all terms and conditions as well as the 'house rules.' A damage deposit will be collected in advance and returned upon a walk-through following your stay. I have an on-site property manager who will be sure everything is in order for your stay. THANK YOU!